I’m a worrier. A fretter. An anticipator of disaster. I can’t seem to help it. I try not to let it stop me from doing things, but I worry anyway. At this time last week, I was worried. I was getting ready to go to Ban Pui, a small village at the end of a long, windy, rutted muddy road at the top of a forested mountain peak in northern Thailand. With such stellar communication abilities, I was anticipating three very long, quiet, frustrating and confusing weeks ahead – especially since Thai isn’t even the primary language in Ban Pui. As bad as my Thai skills are, my Pwo Karen vocabulary consists of a whole 9 words. 2. During my last visit to Ban Pui, it rained non-stop for 3 full days. 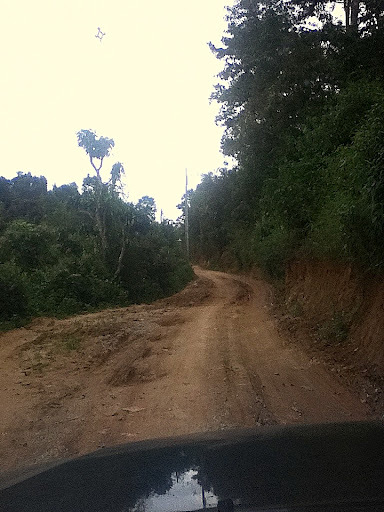 The roads were covered in thick, slick mud, and we fishtailed our way up the mountain, occasionally skidding a little too close to the cliff’s edge for my comfort. Once we established that I’d be returning in September, someone reminded me that September was rainy season, and therefore the “roads might be bad.” So, my second worry was that I would get washed off the side of a mountain, making worries #1, #3 and #4 irrelevant. 3. Electricity. On my first visit, the school’s principal asked when I planned to return. When I said September, she replied, “Oh good. We should have electricity by then.” I mentally ran that through my ‘Asian-speed-optimism’ filter, and calculated that electricity would likely arrive sometime in December. As a result, I was prepared for 3 weeks of wandering around wearing a head lamp and carrying 20 pounds of batteries for my recording equipment. 4. Some of my readers might not believe it, but I’m really quite shy, and talking to strangers stresses me out. Apparently, “Don’t talk to strangers.” was the one childhood admonition I took to heart. Life as an adult would have been much easier if I had remembered “Don’t run with scissors” and “Don’t eat paste” instead. The idea of approaching dozens of strangers to interview them for my thesis, using a language I don’t understand was, to put it mildly, daunting. For these reasons, at this time last week, I was a worried mess. On Monday, my Bible Study group was kind enough to add this little worry-wort to their prayer list, and did their best to encourage me. On Tuesday, I took a deep breath, tossed my backpack into the back of a truck, and hit the road. 1. One of the teachers and the principal speak English. With some back-and-forth over the meaning of some words in either language, we’re able to communicate pretty well. The other teachers speak some English, and speak to me slowly, and are patient with my dreadful pronunciation. Despite the language barrier, we’ve all shared some good laughs and conversations. 2. The village hadn’t had rain for 3 days, so the roads were dry and bumpy, not slippery at all. I also remembered to take my motion-sickness tablet, and felt pretty good about the whole trip. 3. The school got electricity and WiFi the week before I arrived. I can re-charge my equipment with ease, and even manage the occasional facebook update if time permits. 4. 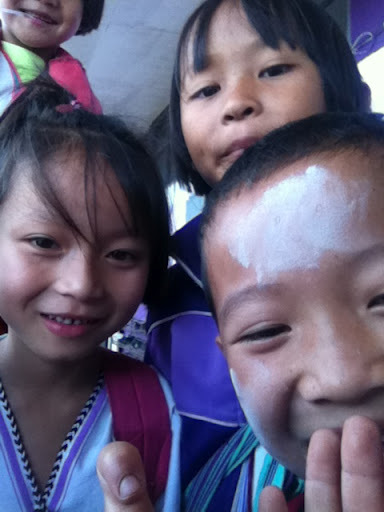 The teachers, villagers and students are friendly, welcoming and kind. I’ll write more about them, and life in the village in my next post, since I’ll be spending next week conducting my interviews. But for now, I’ll leave you with pictures of kids from the Grade 1 class. Yea – God is the God who goes before us. He is a God of peace in anxious times. So glad it's working out for you. 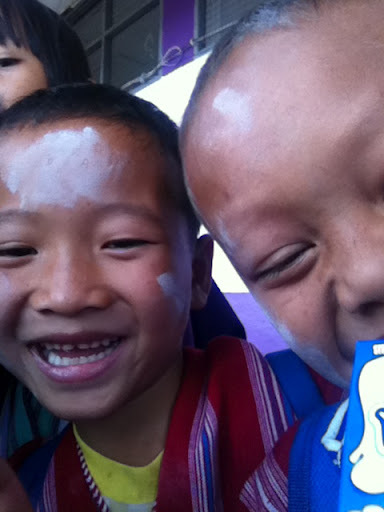 Also glad that you are learning to love the Karen people. I sure do. 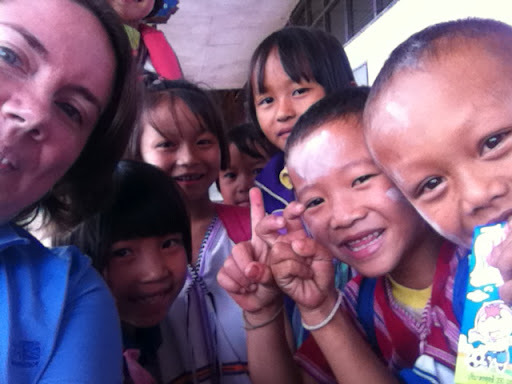 Great to have an update on your adventures in Ban Pui… I'm really impressed and slightly envious! And I can identify with the worries bit all too well 😉 Will keep praying for you during your time there and look forward to hearing more. I want to come join you! Oh, other than the beetle… Can't wait to get your updates and hear your thinking as you process this crazy, unique, stretching experience!